The idea was of the sort sound in concept, but not so much in execution (although only because it was a rather hairy maneuver). Peter went first, clipping into the chain link section using a sling and then throwing his left leg over. 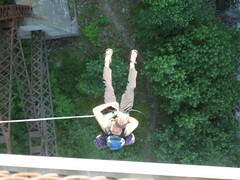 He then clipped a second sling lower down and unclipped the higher sling. Climbing down a little ways, he took up the slack through his belay device. Finally, with one hand holding the rope firmly in his hand, he pulled himself up on the chain link fence just enough so that one of us could unclip his sling. After that, it was very fancy move that involved letting himself down slowly and then quickly transferring his hand to the rope so that he’d have two hands on it. That was pretty much all there was to it. Peter wrapped the rope around is leg to hold himself in place while he adjusted his grip and then continued to slide down the rope. As Peter reached the bottom, a small crowd of people began to gather (since the rope was stretched across the walkway, we had everybody halt and carry their bike over the rope). I clipped in and climbed over, but had second thoughts about using just a t-shirt as my hands sole protection from the high heat that would soon build up due to the friction.